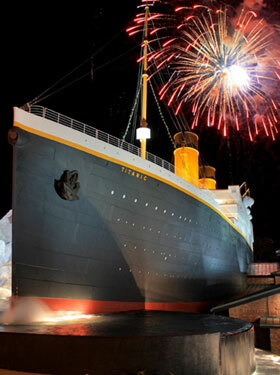 There will be massive fireworks for Thanksgiving in Pigeon Forge, courtesy of the Titanic Museum Attraction. It’s a hundred years since RMS Titanic foundered on an iceberg and sank to the bottom of the North Atlantic, and the famous memorial museum in Pigeon Forge has been honoring this centenary all year. Now at Thanksgiving, the museum aims to light up the night with a fireworks display the Smoky Mountain Parkway hasn’t seen since the last time Titanic did this – at the museum’s grand opening two years ago – and the entire ship will be aglow with Christmas lights and decorations inside and out. The action starts at 7 pm with real, falling SNOW off the bow of the ship that the Titanic folks produce every year with a snowmaking system. They’ll continue to make this winter wonderland through Saturday, and then every Saturday all December. Bring your cameras is the advice offered for this spectacular event. Around 7:30 pm, when it gets dark, the fireworks will begin, and you can get a ringside view for free in the parking lot. All are welcome, no reservations required, just show up. Meanwhile inside the museum attraction, the usual stunning display of period people, activity and artifacts will be supplemented with costumed merry-makers and thousands of lights, with period decorations and even a Father Christmas from a hundred years ago. The museum offers tours every hour all day up to 10 pm on Thursday (tours take 1.5 to 2 hours). It’ll be a busy day, say the Titanic people, and you should definitely book ahead if you want to take a tour. The Behind the Scenes exhibit of James Cameron’s great movie is still being presented through the rest of this year also. 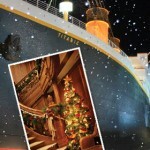 There’s always lots to see and do, and great mementos to buy, at the Titanic Museum Attraction and if you’ve never been this Thanksgiving time may be the one you want to catch!